Hello ... Hello ... my old friends ... It's great to see you once again! 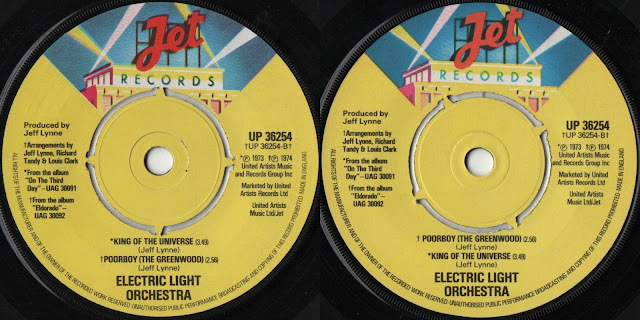 Back in October 2013, Yours Truly KJS wrote and published an article for elobeatlesforever (elobf), entitled KING OF THE GREENWOOD, wherein I noted the difference in the listing of the tracks "King Of The Universe" and "Poorboy (The Greenwood)" on the 'B' side of ELO's "Telephone Line" 7" single between the original Jet/UA issue (UP36254) and the later Jet/CBS re-issue (SJET101). However, since the aforementioned article, I've acquired a mint condition promo copy of UP36254. And while I was rummaging through my ELO record collection the other day, I discovered a further twist in the story in that the 'B' side of the promo was opposite to that of the standard issue UP36254 and therefore in the same order as listed on SJET101! 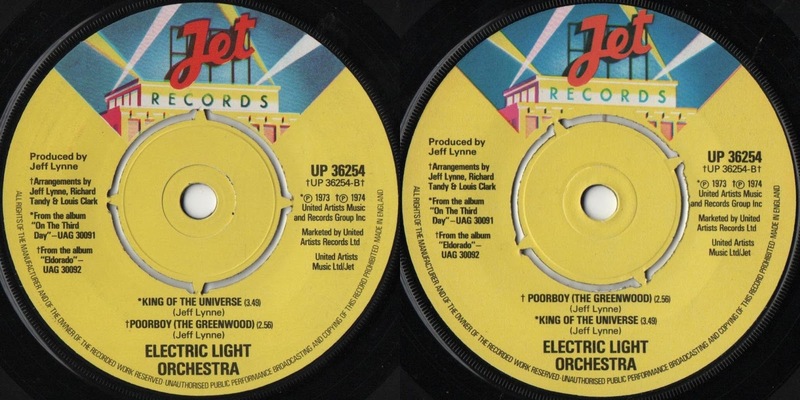 The physical running order on all three (3) records is "King Of The Universe" followed by "Poorboy (The Greenwood)" which means that only the standard issue UP36254 is wrong and that the Jet/CBS re-issue actually corrected the mistake. It just goes to show that you never know what will turn up next when you are a studious collector of ELO (and related) vinyl!